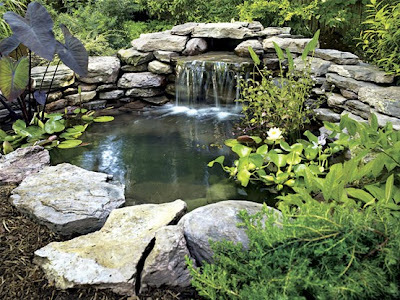 Building a small pond in your backyard is no easy task, but when you are finished the end result is both rewarding and beautiful. An outdoor oasis can create a serene setting that makes spending time in your backyard feel like you’re on a relaxing vacation (and who wouldn’t want that!). Depending on the purpose of your pond, you will need to start by deciding on the size of the pond you wish to create. Most people that build a backyard pond like to keep goldfish or aquatic plants. These types of ponds need to be at least two feet deep. If you live in a region that sees freezing temperatures in the winter, you will need to dig an additional foot or two to accommodate the frost line and protect your plants and fish. You will also need to find the right location, avoiding areas where runoff water can harm your pond life or near areas too filled with trees which can cause a lot of debris to get trapped in the pond. Use a rope to create the shape of the pond. Once you have played around with various shapes and determined which one looks best, it’s time to start digging! You’ll want to dig the pond with a slope if you plan to include a waterfall. You can also include varying depths in the pond to accommodate fish and plant life. For instance, the shallow end can be dug down to a foot deep with the following shelf being dug to 18 inches deep, and following into the deepest end with a depth of 24 inches deep. Set in your pond filters and skimmers to the proper depth for your pond size. You’ll now want to add a pond liner making sure it is placed evenly and smoothly along the entire hole. This important step is necessary to keep the water in place. You do not want a lot of folds and wrinkles that can compromise the liner and develop holes. You may have a few areas that do not set exactly flush with the bottom of the pond floor or walls. Follow directions for connecting filters and skimmers. You can begin placing the copingstone along the edge of the pond. The liner will need to be placed behind the stone above the water level. You can add backfill on top of the liner to keep it protected and out of the way. Add plants to the pond area and begin to decorate the space with rocks, pebbles, and gravel. If you plan to add fish to the pond, you will need to consult with the fish retailer for proper water preparation prior to adding the fish to the pond water. Depending on the size of your pond (and how many people are helping out) it may only take a weekend to build a backyard pond. But rest assured, when it’s done, you will be thrilled with your accomplishment! Here's a nice little video that shows the step-by-step process of how to build a backyard pond. Melissa is a landscaping enthusiast and avid DIYer during her free time on the weekends. During the week she blogs about containment solutions for MPC Containment.